At the tender age of 91, Aznavour, probably one of the most famous French singers in the world, is about to launch his 51st Album 67 years after his debut album. His passion for singing and performing on stage determinedly, relentlessly carried him over the years. Having performed before audiences since the age of 9, the young man grew into the great Charles, music-hall icon, cornerstone of French song and one of the very few Gallic artists with a truly international following over the decades. Today, the miracle is not over. Aznavouris singing, Aznavouris touring the world. Charles Aznavourtalks about his profession with modesty, sincerity and relevance. His humour, repartee and frankness are legendary. For that is Aznavour’s great grace and mystery: his eternal youth and resilient character tempered with joy and innocence. And now a new album entitled “Encores”, an allusion to the audience’s shouts for more at the end of a concert. Charles wrote the album himself, exploring his memories (the single “Avec un brinde nostalgie”) and his joie de vivre too, simply sharing his “Encores” with those he loves. He also touches on his youth in the streets of Montmartre and his memories of Edith Piaf, passing time. This album, produced by Marc di Domenico, is a nostalgic reflection on the times gone by, with a touch of humour. Accompanied by accordion, piano or strings, Aznavour's 90-year-old voice is sometimes gently flickering, which makes it even more touching. This beautiful album is a treat, shining with sincerity. 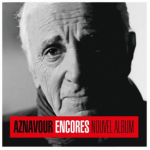 In "Encores" Aznavour explores his memories with "Avec un brin de nostalgie" or "Les petits pains au chocolat". Harry Rabinowitz on Radio $ Desert Islands Discs end of June tells how he asked Charles Aznavour to write two songs, both of which were poor. On the third try he wrote "She" which became an international hit for him. He has never looked back!